As their experience expands, active divers soon realize that Level 1 certification should be augmented by more training. Then, as divers become more comfortable in cave environments, and as caves reveal their beauty, versatility, and complexity, divers long to penetrate further. The GUE Cave Diver Level 2 class, which stands out in the dive industry as a full class of the highest quality is a logical next step. Divers are expected to have acquired a high level of awareness and solid fundamental skills in order to master the demands of this class. The training builds upon the skills, knowledge, and experience acquired during the GUE Cave 1 class as well as divers’ own experiences in cave-dives after completion of GUE Cave Diver 1. Course outcomes include, but are not limited to: increased environmental awareness, increased capacity with extended penetration dives, advanced navigation, use of jump spools, enhanced team awareness, advanced problem resolution, stress management, and use of a stage and/or decompression cylinder. Have passed the GUE Cave 1 course. Must have a minimum of 25 logged Cave 1 level dives beyond GUE Cave 1 certification. Hold insurance that will cover diving emergencies such as hyperbaric treatment, e.g., DAN Master-level insurance or equivalent. The Cave Diver Level 2 course is normally conducted over five days. 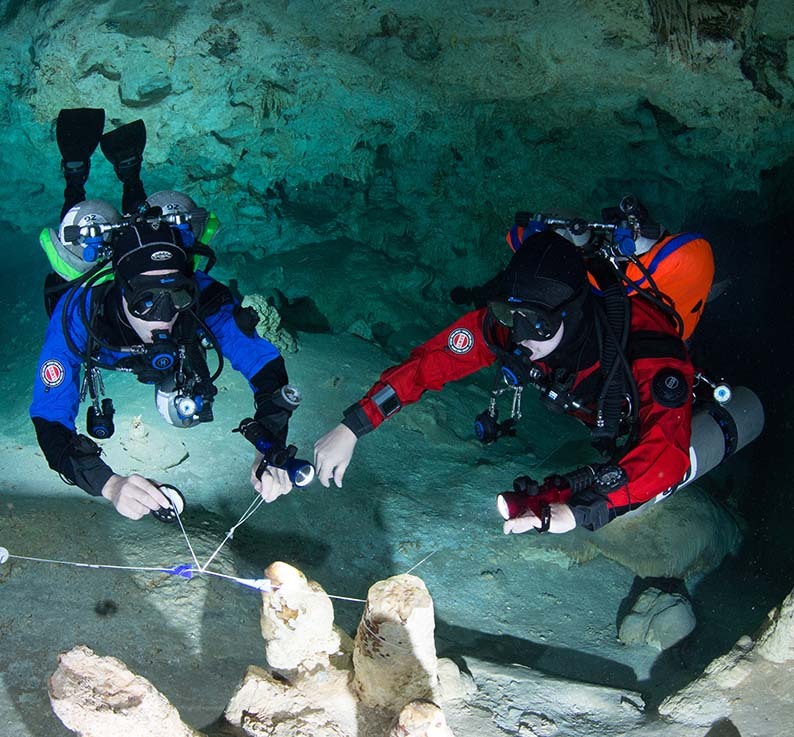 It requires a minimum of ten cave dives that are conducted in at least three different caves2 and at least forty hours of instruction, encompassing classroom lectures, land drills, and in-water work. Divers wishing to use triox as a breathing gas are required to review all Triox Primer academics, including the exam, with their instructor and perform at least two dives using triox 30/30. Successful completion of these objectives results in the addition of triox 30/30 to the allowed post-certification breathing gases and will be noted on the Cave 2 certification card. Cave survey and cartography are highly important aspects of cave exploration and are useful for all advanced cave divers. In this special GUE class, divers will learn all the required skills to conduct a full survey of the cave starting from an in-water survey to drafting a map of the cave. During the class, team-based survey procedures and dive planning are introduced together with additional tools and specialized equipment. ​​​​​​​Many divers who have undertaken GUE’s survey class have been involved in exciting cave exploration projects all over the world. The use of diver’s propulsion vehicles (DPV) or scooters has a long tradition in cave diving. DPVs are often used as an important tool to further increase the penetration distance or to carry additional heavy dive equipment into the cave. Since failure of a DPV in an overhead environment might expose divers to a high level of risk, an in-depth knowledge of gas management and contingency planning is required to use a DPV safely during such dives.